Our Supported Lodgings scheme sees young people aged 16-25 in housing need matched with local hosts. The Supported Lodgings hosts provide support, encouragement and friendship to young people for up to two years’ stay. The young people are looking to return to education, employment or training. Amin Hassan, 20, lives with host Frances Peebles, 66 in her home in Surbiton. Frances first saw a video clip about homing refugees at her local church and wanted to get involved as a host to help young people. “After seeing that clip, I contacted social services to become a host, Social Services then referred me to Natasha Price the Supported Lodgings Co-ordinator at YMCA Surbiton where I then signed up to become a Host on the scheme.” Natasha then put Frances in touch with Amin. “I’m a teacher and had been teaching and supporting older boys, so I knew a male lodger would be ideal for me because I understand them,” says Frances. 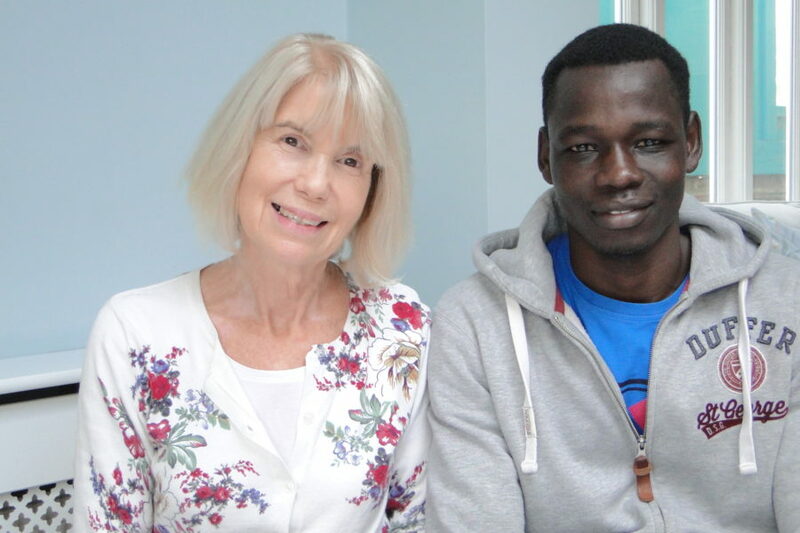 Amin attends Richmond College each day, studying English, Maths and ICT. One of Amin’s goals on his two-year development plan was to sign up at a boxing cub in Earlsfield which Natasha set up for him. It’s a new sport he’s taken up and which he loves. “It’s my dream to become a boxer,” he says. With four matches under his belt as a middleweight fighter and two wins, he is doing well. Frances & and her two sons have been to his matches to cheer him on. “He’s a natural!” says Frances. Originally from Sudan, Amin has three sisters and three brothers and speaks Sudanese, Arabic, English, as well as his tribe’s language. “I went to Arabic school to learn the Koran in Sudan – so learning English here has been difficult,” he says. Frances and Amin get on really well and have a great friendship. “Frances always helps me, I’m very happy living here. I can also chat to the other guys that live here, they are a similar age to me,” says Amin.